Oct. 15, 2013, 2 p.m.
By Justin Ellis @JustinNXT Oct. 15, 2013, 2 p.m. The International Herald Tribune officially became a thing of the past this morning, as the 126-year-old newspaper officially became the International New York Times. To promote the switch, the Times is making access to NYTimes.com and its new international counterpart, as well as the Times iOS apps, free for five days. The free access is sponsored by Citi, which also recently sponsored part of the Times’ Scoop app for iOS. The marketing and press push will resume Friday in Tel Aviv, where Thompson and INYT publisher Stephen Dunbar-Johnson are scheduled for a panel discussion at the Peres Center for Peace hosted in conjunction with the Isreali newspaper Ha’aretz. Then on Monday, Oct. 21, Dunbar-Johnson and Times Company vice chairman Michael Golden will host a reception at the DealBook Global Forum in Hong Kong. On the 23rd, in a joint event in Tokyo tied to a new partnership with The Japan Times, Andrew Ross Sorkin will join a discussion on “Innovation, Investment and the Japanese economy.” The next day there’s a Tom Friedman talk about “hyperconnectiveness” in Singapore, where his Global Forum takes place the following day. 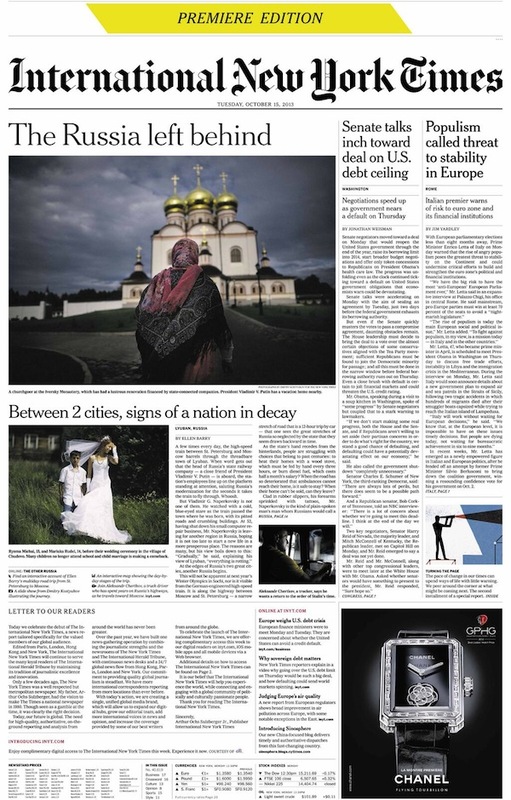 Part of the transition to a International New York Times has meant shuffling and reorganizing the staffs of the two papers, in the Paris newsroom as well as in bureaus around the world. They’ve also expanded the opinion section of the International New York Times, with new writers for the paper’s editorial board as well as more than two dozen new contributing opinion writers (including recent Nieman Fellow Maxim Trudolyubov). 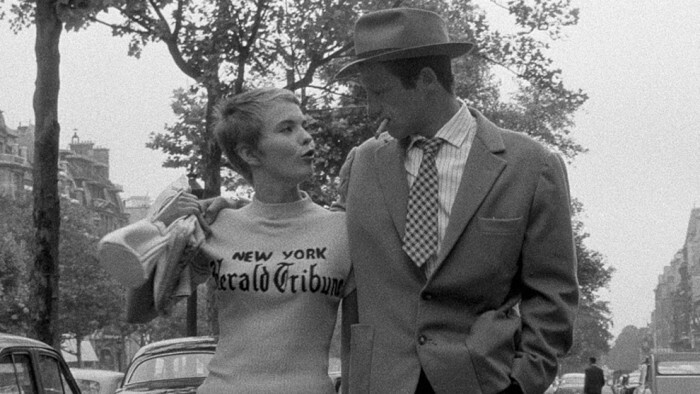 The International Herald Tribune was the latest incarnation of a newspaper founded in Paris 126 years ago as the European edition of the New York Herald, which was a rival of the Times in the bruising mid-19th century New York newspaper industry. James Gordon Bennett Jr., son of the founder of the sensationalist and popular Herald, put to use new trans-Atlantic cable just as readers were spreading out by rail and steamship. Over the years, the Herald Tribune became an ink-and-newsprint staple for U.S. expatriates and foreigners looking for a dose of Americana. For more than a century, it was one of the few distributors of English-language news — plus baseball scores, daily crosswords, and comic strips — to readers in far-flung corners of the globe. The staff of the IHT produced an interactive special section looking back on the history of the paper, its reach, and its reporting. It’s worth diving into if you’re curious about things like famous front pages from the paper’s history, the editorial after the day the USS Maine was sunk, or Art Buchwald’s thoughts on the the wedding of Grace Kelly. POSTED Oct. 15, 2013, 2 p.m.
Ellis, Justin. "Around the globe with the International New York Times." Nieman Journalism Lab. Nieman Foundation for Journalism at Harvard, 15 Oct. 2013. Web. 19 Apr. 2019. Ellis, Justin. "Around the globe with the International New York Times." Nieman Journalism Lab. Last modified October 15, 2013. Accessed April 19, 2019. https://www.niemanlab.org/2013/10/around-the-globe-with-the-international-new-york-times/.